GC2016: Where is the zeal for agency reform? The Rev. L. Fitzgerald “Gere” Reist II announces to the 2012 General Conference that the Judicial Council has ruled Plan UMC, agency restructuring legislation, unconstitutional. An effort to reform United Methodist agencies in 2012 had the endorsement of bishops, the advocacy of church leaders and the vote of General Conference. The only snag came on the last day of General Conference — when the Judicial Council, denomination’s top court, ruled the plan unconstitutional and void. Now, a determined group of United Methodists is bringing back a slightly revised version of the plan to the 2016 General Conference when the denomination’s top lawmaking body meets May 10-20 in Portland, Oregon. They believe “Plan UMC Revised” is now constitutional and still can win the majority of votes. What the new plan lacks, proponents acknowledge, is the denomination-wide fanfare that agency restructuring proposals received just four years ago. Underwood is the senior pastor of Christ United Methodist Church in Plano, Texas, a General Conference delegate and one of the six drafters of the restructuring plan. The thrust of that reform is reducing the number of agencies and increasing their oversight with a strong executive. The plan has its critics — among agency leaders and others. Fred Brewington, a General Conference delegate from New York, criticized Plan UMC Revised as too similar to a corporate model. Nonetheless, Underwood and other proponents are hoping to reinvigorate the passion for agency reform, even as a Judicial Council review of the legislation is still pending. They are doing so without the advocacy of some major players in denominational leadership. That raises the question: What has changed? It gives the Connectional Table, a church coordinating body, new authority to elect the top executives for United Methodist Discipleship Ministries and the boards of Global Ministries, Church and Society, and Higher Education and Ministry once those agencies’ boards have nominated a candidate. The legislation says the top executives will be accountable programmatically to their boards and administratively to the newly created position of Connectional Table executive general secretary. It authorizes the Connectional Table executive general secretary to evaluate these agencies’ top executives annually and possibly recommend their dismissal “based in large part on the degree of cooperation and collaboration with other agencies toward the goal of making disciples of Jesus Christ.” The legislation bans a bishop from holding this position. It reduces the size of some agency boards and the Connectional Table, while increasing representation from outside the United States, especially Africa. The Connectional Table, for example, would see its total membership decrease from 59 to 45. It eliminates the United Methodist commissions on Religion and Race and the Status and Role of Women. The plan moves the commissions’ work to a new Connectional Table committee called the United Methodist Committee on Inclusiveness. It makes few changes to United Methodist Communications — which includes United Methodist News Services — or United Methodist Men. The Council of Bishops — in referring the revised plan for Judicial Council review — made clear the action was “in no way intended as support or opposition” to the proposal. The plan also is getting some pushback from the Connectional Table, a denominational leadership body that in 2012 was one of the biggest champions for agency restructuring. The 59-member Connectional Table acts as sort of a church council for the denomination, coordinating general church ministry and resources, including the work of the agencies. But this is not the same Connectional Table as four years ago. More than half of the Connectional Table’s membership has changed, in part because some of the most ardent reformers had completed their eight-year terms. Among the new members are a number of lay people and clergy who were critics of the body’s 2012 restructuring proposals. Brewington is one of those critics, and he urges holding off on agency restructuring. He noted that there are two ongoing endeavors, started at the 2012 General Conference’s behest, that when completed would have far-reaching effects on the work of the agencies. Those initiatives have commanded many church leaders’ attention these past four years. The United Methodist Board of Church and Society has the task of revising thedenomination’s Social Principles to be more globally relevant. The General Conference’s Standing Committee on Central Conference Matters has a separate mandate to make the Book of Discipline’s largest section — Part VI, Organization and Administration — truly global. That section includes agency functions and administration. Neither Church and Society nor the standing committee expect to complete its proposals until the 2020 General Conference. “I think what we’re really looking at is something that is going to be more holistic for the denomination in the long run (than agency reform),” said Brewington, who is also a standing committee member. However, Lonnie Brooks, one of the drafters of Plan UMC Revised and a General Conference delegate from Alaska, said he and other plan proponents believe the denomination has waited long enough to see significant changes in the agency operations. “How can taking action in 2016 be seen as rushing?” he asked. To him and others, change already has been eight years in coming. Brooks and other restructuring proponents point out in a statement that the impulse to reduce the number of agencies and strengthen their oversight came out of the Call to Action, an initiative that examined both congregational vitality and general church operations. The Council of Bishops and Connectional Table officially launched the initiative in the wake of the 2008 economic crisis and the decades-long decline of U.S. membership. As part of the endeavor, church leaders commissioned an operational assessment by the outside consultant, Apex. The Apex study found that agencies often failed to collaborate with each other and their boards were too large and met too infrequently to provide effective supervision. Ultimately, three comprehensive agency restructuring plans aimed at addressing these issues ended up going before the 2012 General Conference. It wasn’t smooth sailing for any of the plans at the lawmaking assembly. The original Plan UMC and its revised version are the result of a compromise between two of the restructuring plans. Plan UMC passed by nearly 60 percent of the vote. 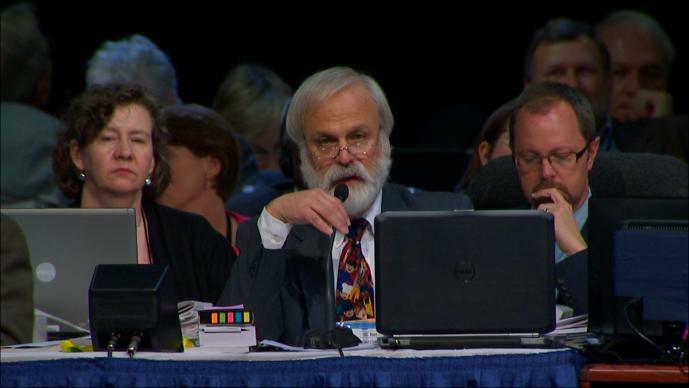 After the Judicial Council struck down the original Plan UMC, the 2012 General Conference spent its last night trying to salvage some of the reforming impulse by approving legislation submitted by agencies to shrink their boards. Great Plains Area Bishop Scott Jones said agencies should be consolidated even further than what Plan UMC Revised proposes. However, Jones said an improving U.S. economy has sapped the sense of urgency, and as he sees it, the Council of Bishops has given insufficient attention to the Call to Action over the past four years. He commended the Plan UMC Revised proponents for working on reform. “Our current system of funding and administering general church ministry is unsustainable, and yet there is insufficient attention being given to fostering a new way of living and serving as a global church,” he said. Many United Methodist leaders would agree that structural reform is needed denomination-wide, but they disagree on what that change should look like or the timeline for carrying it out. The Rev. Amy Valdez Barker served on the initial Call to Action Steering Team and is now the top executive of the Connectional Table. “The Call to Action was really about looking at the church as a whole and beginning to focus our attention, energy and resources toward increasing vital congregations across the connection,” she said. 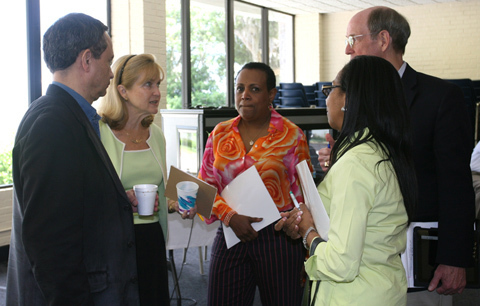 The Connectional Table, she said, has worked the past four years to help agencies collaborate to bolster church vitality.